We have managed to get through six years of school with very few incidents of bullying. But now Katie’s in middle school and the landscape has changed. 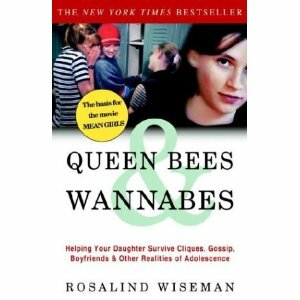 Thankfully, we started reading Queen Bees and Wannabees together just before school started. What a great book. We are only about half way through (homework is blowing out our time together) but the first half is awesome. It describes the Girl World and how the rules and roles are changing – especially in junior high. Katie loved listening to the different descriptions of each kind of girl and the role she plays in the larger group. Because Katie hasn’t been in public school, she isn’t really part of a group yet. She was also born an arm-chair psychologist so she has an uncanny way of understanding others motivations in a way most kids don’t. Fast forward to right now. Katie has met her first official Queen Bee and she is a bully. A bona fide, no-holds-barred idiot who has decided my kid needs to be put in her place. It started with “accidental” backpack bumps and mocking. It has escalated to more overt pushing and putting Katie down in class (PE class – perfect isn’t it?). This bully managed to stab another boy in the back with a pencil, sending him to the office nurse because it got so swollen. I have begged Katie to tell the girl to stop. Just stop. But Katie feels she can handle it and her current strategy is to ignore her. Probably not a bad approach until Frisbee golf late last week, when Katie accidentally hit the Queen Bee in the head with a Frisbee. Of course this lead to a big discussion on Freudian Slips and are accidents really accidents. But the bottom line is now the simple bullying is on the verge of escalating. So I don’t have a tidy conclusion. I am at an impasse with my daughter on how to handle this. I want her to make some adult aware of what’s been going on in case it gets worse. She wants to downplay the whole thing; sure that it will blow over. She has good judgment and maybe that’s the hardest part – knowing when to trust her’s or mine. We are at the point in growing up aren’t we? UPDATE: In mid October, Katie hopped in the car after school and said the bully told her she had big feet. Katie said, “yep, I do! I am going to be tall. !” And the bully replied, “no, those big feet are going to get you beat up.” I jumped from the car and marched Katie right back into her last period – PE. The teacher was there and I made Katie explain what had been going on. For me, hearing “beat up” was the line in the sand I was looking for. The teacher handled it wonderfully. Asked Katie how she wanted to proceed and Katie said a face-to-face meeting with the other girl (I was shocked, what a brave choice!). Katie explained later she didn’t want the girl weaseling out of anything, she wanted to make sure she owned it. A day later they had a CRT (Conflict Resolution something) and it was discussed. The upshot, was a week later, said bully came up to Katie in the halls and said, “Hi Katie, how are you?” and was apparently genuine! Katie was floored. There haven’t been any more problems. I am keeping my fingers crossed! I'm a mom of a 16 year old sophomore girl currently attending a very large high school (4200 kids). The cattiness started around 5th grade and escalated in 7th grade. I too struggled with interfering but also realized the consequences to her for getting involved. I agree that kids back in the day were mean but this is a whole new breed of bullies and mean is putting it very lightly. I've found that some girls have a tendency to be vicious and really have no fear or respect for authority. Your daughter sounds very intelligent and pragmatic. I'm sure she could stand up for herself when needed but my question is why have her suffer and dread school if she doesn't have to? I would contact the school counselor and fell her in on the situation. Ask that your calling not be mentioned because of the possible repercussions to your daughter. The counselors will understand completely and they will begin to keep a close eye on your daughter and the bully. I'm sure the bully already has a history with the school so they'll probably be familiar with her bullying style. In my opinion, you send your daughter to school which theoretically should be a "safe environment". If something happens (knock on wood) you will no doubt hold the school largely responsible for not protecting her. But what about your role as the parent? If your daughter's well-being is yours as well as the school's, then it's a partnership and you need to give the school a heads up. It's not worth taking the chance. Trust me. I was actually just writing about bullying myself, but from the perspective of a teacher of college writing and graduate student in reaction to Tyler Clementi's suicide, so your tweet caught my eye. From my memories of my younger years, when I was indeed a victim of bullying, I think it's super important for you to provide a support system for your daughter, a free space where she can talk out her problems. It is in that space that you can offer her guidance. When the bullying peaked, I hardly had any friends, if any. Even the kids who used to hang out with me shied away from me for fear that they would be targeted next. The entire class jumped on board with the bully, and I found myself completely isolated. It was miserable. I came home crying everyday, and the teacher, not only did nothing, but in many ways reinforced it. On the flip side, you can only do so much as a parent. Though as adults, we can see how petty the bullying was and say, "if I knew what I knew now, I would have stood up to the bully and said…" for kids, they are very much a part of the social system and will have to deal with the consequences of their actions. Your daughter has to find her own self-confidence and ways to mentally combat bullies. Writing about it might help her. I think reading with her is a great idea! I also think that if she finds something she is good at outside of school, it makes a big difference. Then, she isn't fully building her identity around the school system. For me, entering the world of horseback riding completely changed my life. I made new friends, found something I was good at, and became a mentor for the younger kids that were riding. It really gave me a self-confidence boost which translated into my day-to-day interactions and made me less-targetable by bullies.